Saturn by Cassini - Solar System Planets And Moons Section. Saturn taken by Cassini looks it was drawn. After a few days of delays, NASA's Mars Reconnaissance Orbiter has begun its journey towards the Red Planet. The orbiter lifted off atop a massive Atlas V launch vehicle from Cape Canaveral at 1143 UTC (7:43 am EDT). The spacecraft established radio contact with controllers on the ground 61 minutes after launch and confirmed that everything's working well. MRO will reach Mars on March 10, 2006, and begin several months of aerobraking maneuvers to lower its orbit. This image of Saturn taken by Cassini looks it was drawn by an impressionist painter. 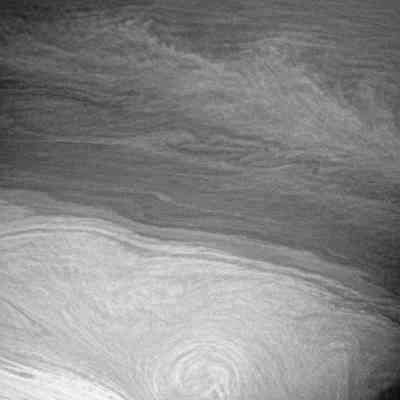 The giant planets' atmospheres are dominated by counter-flowing jets of wind, and this image shows the process up close. You can see the turbulence as these jets shear against each other. Cassini took this image on July 6, 2005 when it was 2.5 million km (1.5 million miles) away from Saturn.